Mitty forward Haley Jones is the Prep2Prep CCS Player of the Year. From the beginning of the season there has been little doubt as to who was going to be the 2018 Prep2Prep Central Coast Section Player of the Year, because it’s the same player that was the 2017 honoree, and that’s Archbishop Mitty superstar Haley Jones. Now the 6-1 wing can add the Prep2Prep honor to an unbelievably long list of other awards and honors the Monarchs junior has garnered this past season. The first one to come along was the Gatorade State Player of the Year that not only combines accomplishments on the court but in the classroom and the community as well, where Jones more than met the criteria for an award that does not have to go to a senior. She was the consensus Player of the Year in the West Catholic Athletic League, the Cal-Hi Sports Bay Area Central Coast Section Player of the Year, the Bay Area News Group Player of the Year, the San Francisco Chronicle Metro Girls Player of the Year for the second straight season, a Cal-Hi Sports Ms. Basketball State Player of the Year finalist for the second straight year and will be First Team All State for the second straight year. The Women’s Basketball Hall of Fame has asked to borrow Haley’s jersey to be displayed in the Hall’s “ring of honor” for her outstanding play this past season. Other national honors include being the only junior on First Team All-American for USA Today, and First Team All-American for MaxPreps. Jones averaged 21.8 points 10.0 rebounds. 4.1 assists,2.5 blocks and 2.0 steals a game and by season’s end with University of San Diego-bound center Nicole Blakes out with an injury, she was playing center and all four other positions on the court. Not too many high school players can say that UConn Coach Geno Auriemma, Stanford’s Tara VanDerveer, South Carolina’s Dawn Staley, and national champion coach Muffet McGraw of Notre Dame, plus coaches from all nine of the schools she’s narrowed it down to - the four mentioned plus Cal, Louisville, Oregon, Texas and UCLA - have come to see her play personally. According to Phillips she’s one of around 35 invitees to the USA U17 Team Trials in Colorado Springs at the end of May. Jones started the season off with a bang for the 29-1 Monarchs by leading then to the Joe Smith Bracket title at the Nike TOC and earning the Division’s MVP award after 22-point, 10-rebound, four-assist performance in a 57-50 title game victory over St. Mary’s-Stockton. 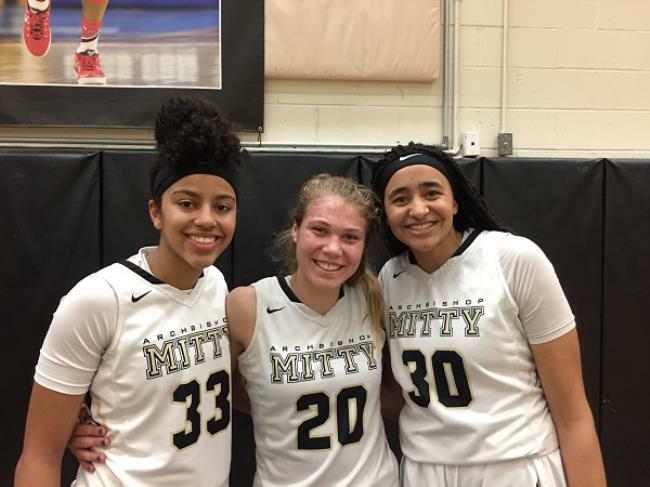 From the she led Mitty to the West Coast Jamboree Platinum Division championship and garnered another MVP honor after going for 23 points, 10 rebounds, six assists and five steals in a blowout win over Folsom. There is no doubt Jones could have scored 30 at will but the consummate team player was always looking to get teammates involved. She did score 30 or more points three times with a high of 33 in a victory over Carondelet-Concord. Jones was in double-figure scoring in all 30 games and had 19 double-doubles, including 17 points and 10 rebounds in a season-ending triple overtime loss to Pinewood in the Northern Regional Open Division title game where she had a couple of calls not go her way and fouled out late in regulation. Jones made 29-of-65 3-pointers (45 percent) and shot 67 percent from 2-point range and 75 percent from the free-throw line. In three years of varsity as a Monarch, Jones has 1,396 points, 718 rebounds and 278 assists. So where does Jones rate in the Mitty girls over the years including current Minnesota Lynx guard Danielle Robinson, and who could she be compared to potentially? For that answer Phillips, who has experience coaching USA Basketball and is the 2018 Naismith National Coach of the Year, is the best person to ask. “In terms of accolades she rates right around the top of Mitty’s all-time best, and when all is said and done after her senior season she may rate at the very top,” Phillips remarked. Whether Haley ever catches Catchings remains to be seen but for now she has a lot of awards under her belt including the 2018 Prep2Prep Central Coast Section Player of the Year. Buck Matthews of Woodside Priory is the Prep2Prep CCS Coach of the Year. His Panthers team only went 17-15 overall. However, with two other Panthers mascots in the ultra-tough West Bay–Foothill League - NorCal Open Division champion Pinewood and perennial small school powerhouse Eastside College Prep - it was difficult to put together a great record. Woodside Priory also had splits with Menlo and Sacred Heart Prep and a league split with a Notre Dame-Belmont team they went 2-1 against overall, so after all was said and done Woodside Priory only went 3-7 in league. Outside league it was a rough and tough schedule that also included two NorCal Open teams, Salesian and Cardinal Newman, plus Miramonte, Heritage, Valley Christian-San Jose and Fairmont Prep-Anaheim. In the end the tough schedule was well worth it because Woodside Priory won a second straight CIF Central Coast Section Division V championship, then went on to win a Northern Regional Division IV title, and came within a whisker of winning the CIF Division IV state championship. For his efforts in what turned out to be a magnificent season, Matthews has been named the Prep2Prep Central Coast Section Coach of the Year. “Wow!! Thanks Prep2Prep. Really appreciate it,” was Matthews’ response by text when informed he was the winner. The Panthers lost a heartbreaker in the state title game when after leading a good portion the way, and in a nip-and-tuck affair during the fourth quarter, some calls didn’t go their way and senior Tatiana Reese fouled out in a 57-53 final they still had a chance to win with their lone senior and best player on the bench. Prior to Matthews taking the helm at Woodside Priory the school had only fielded a JV team. However, since he arrived for the 2014-2015 season not only have his teams been competitive in the West Bay–Foothill League they were the CIF Central Coast Section Division V title winners last season before bowing out in the CIF Northern Regional Division V title game to an eventual D5 state champion Eastside College Prep that was a CCS Open Division team. “It feels good to start something from the ground up,” said Matthews, an Eastside Prep graduate that assisted at Eastside for three years before coming to Woodside Priory. “Some coaches inherit programs so knowing the struggles it takes to build something from scratch I was a little hesitant in the beginning, but yes it feels really good because at Woodside Priory, besides academics girls basketball has become huge,” continued Matthews, who besides coaching the girls is also a middle school coach at Woodside Priory. Matthews now adds the Prep2Prep honor to his recent Cal-Hi Sports Division IV State Coach of the Year. Astrom is only 5-9 and almost always was matched up against girls a little taller, but still got the job done in the paint. She was second on the team in scoring at 14.2 points per game and led the team in rebounding at a 7.1 clip. Astrom also led the team in steals with 2.2 per game and was second in assists at 2.0 per game, and the good news for Pinewood faithful is she’s back together with a solid core of returners. Most players list a position, and the recruiting analysts rate and rank players by position and year, but in the case of Jones, who is the ESPNW No. 1 ranked junior wing and to many the No. 1 junior at any position, it is and it isn’t appropriate, because Jones can play any position on the court and play it at least as well as anybody in the nation. The CCS Player of the Year won so many awards this past season she literally needs a wheelbarrow to tote them around. The Monarchs beat Pinewood once without their University of San Diego-bound senior post in the CCS Open title game but they missed her in the second outing in their NorCal Open loss. Despite going down in the final WCAL game with a knee injury there is no question Blakes is All-CCS First Team based on what she did prior to that. She played 23 of Mitty’s 30 games and averaged 14.5 points, 6.6 rebounds, 3.0 assists, 2.8 blocks and 1.8 steals per game. Two impressive performances were at the Nike TOC the Monarchs won where she had 22 points and 20 points against nationally ranked St. John’s-Washington D.C. and St. Mary’s-Stockton, respectively. She also had three solid outings when Mitty won the Platinum Division of the West Coast Jamboree. Not many players in Northern California have ever been offered by Stanford prior to the end of their junior season, or for that matter many players at all from NorCal or even California period, are asked to grace a Cardinal uniform, but hopping Hannah Jump has the entire package, including an astronomical 4.31 GPA that has landed her at The Farm. Everyone wants a shooter and the 5-11 Jump is just that, plus she’s steadily developed the rest of her game. She led the NorCal Open champs in scoring (16.7 ppg), was second in rebounding (5.6 rpg) and was right around two assists and steals a game. Jump drilled 102 three-pointers and shot 45-percent from outside the arc, 57-percent on 2-pointers and 84-percent from the free-throw line. Jump has 266 career treys and if she gets 100 or more next year she’ll be pretty high up on the career list in the Cal-Hi Sports Record Book. Along with Haley Jones the Penn State-bound Ortiz gave Mitty the top 1-2 punch not only in the CCS and Northern California, but all of California and the entire nation as well. More than once Ortiz came up big on either offense or defense, or both. Despite being a 6-0 wing that played a lot on the perimeter, Ortiz had 17 double-doubles last season and averaged 14.3 points, 8.4 rebounds, 4.5 assists and 1.3 steals per game. Despite not seeing a lot of time as a freshman she leaves Mitty with career averages of 9.2 points, 5.4 rebounds and 3.6 assists per game. With all due respect to the roster of the South City girls it’s not a stretch to say the big reason the Warriors were 26-5 and 12-0 in the Peninsula Athletic League–North is because of this Cal Baptist University-bound 5-9 senior that took a lot of lumps from double- and triple-teaming by the opposition. Even so, the three-time PAL – North Player of the Year and San Mateo Daily Journal Co-Player of the Year this season still managed to post some very solid numbers and finished with per game averages of 16 points, six rebounds, six steals and five assists. The WBAL MVP and UC San Diego-bound Claros is the top selection on the second team. This past season the Panthers floor general averaged 11.2 points and 4.4 assists per game and always drew a tough defensive assignment. She also became much more aggressive attacking the basket, and in fact her floater driving down the lane pulled out a win against Cardinal Newman, and she used it successfully against Mitty as well. There were several girls for the Fighting Irish that came up big during the season but in the end the player that emerged as the top player on the team was this 5-10 junior that was the tallest starter and was almost always matched up against a taller player, but none more physical and aggressive attacking the glass as Li-Uperesa. She had a solid eight points and 11 rebounds in the NorCal D1 title-game victory over Miramonte, and although she had a tough outing in the CIF D1 state title game loss to Serra, Li-Uperesa still led the team in scoring and rebounding at 13.3 points and 8.5 rebounds per game. When the 5-7 senior star went down with a severe ankle sprain and Eastside up 15-8 in the CIF D1 NorCals over a Sacred Heart Cathedral they had beaten in two previous meetings, the dream of a third straight state championship was pretty much down the tubes as the Panthers went down against the Irish. Even so, in her three years the won two CIF state championships, three CIF Northern Regional titles, and this year after getting pushed up to Division I for NorCals she led the Panthers to the second round. Tahaafe played all 28 games for Eastside and around 28 minutes a game and led the team in scoring at 14.4 ppg, was second in rebounding at 6.7 rpg, and first with 4.1 assists and 2.3 steals as well. This Colgate-bound 5-10 senior wing and team leader that was called on to play just about every position on the floor by Presentation coach Wade Nakamura. She averaged a very solid double-double 16 points and 11 rebounds per game and helped lead the Panthers to a second place finish in the West Catholic Athletic League and the top seed in the Northern Regional Division I playoffs while earning All-WCAL First Team honors for the second straight year. The top player out of the SCCAL, Ackerman led the Mariners to an unbeaten run through league play, and then carried them to the CCS Division III championship game before falling to South San Francisco. For the year, she averaged 16 points, nine rebounds, three steals, and three blocks per game. That included a 22-point, 11-rebound, five-block performance in the section title game, which was duplicated a week later by scoring 22 points with nine rebounds in a NorCal regional quarterfinal loss to Clovis, after scoring 19 points in a first-round win over Marin Catholic. The CCS Freshman of the Year gets the nod for one of the spots on the third team after becoming one of a handful of freshmen, including teammate and CCS Player of the Year Haley Jones, to start for legendary Mitty coach Sue Phillips. And she did it on a team that despite losing to Pinewood was No. 1 in the nation in the computer rankings and No. 3 in the human rankings. She was asked to take on tough defensive challenges by Phillips and averaged 6.5 points and 3.3 rebounds a game and played in all 30 games for the 29-1 Monarchs. With competitive equity pushing the top teams and players up and thus dominating many of the All area teams including the P2P All-CCS three teams, Leong, the Santa Clara Valley Athletic League – De Anza MVP and two-time All-League First Team selection was in the mix with several players including Cedeno, Paige Uyehara of St. Francis, Ila Lane of Woodside Priory, and Krissy Miyahara of Mitty. In the end one of the six spots on the third team went to the Vikings senior that went over the 1,000 career point mark this past season while averaging 19.7 points with 74 three-pointers, and 6.9 rebounds per game. Leong finished her four-year varsity career at Paly with 1,190 points and 220 three-pointers. The school only had a JV program before Reese came to Woodside Priory four years ago but my how that has changed. This season, Reese and her teammates fell a little short of a state championship, but she still graduates with two straight CCS Division V titles and a CIF Northern Regional title to show for her efforts, and while some All-area teams did not give Reese her proper due, it’s a second team honor for her in our judgment. “We go nowhere without her,” Priory Coach Buck Matthews said. The second Fightin' Irish player to get an All-CCS honor off the CIF Northern Regional Division I champions played her heart out in both the Northern Regional Division I title game where she was tied for game-high with teammate Yaniah Fleming with 12 points, and the CIF D1 title-game loss to Serra where she led the team with 14 points including two three-pointers, which was double what Serra had as a team. Silvestri averaged 12.4 points and 4.4 rebounds and made 75 three-pointers while shooting 46 percent from outside the arc. After what the 5-5 flashy guard did, and particularly in big games, for a Panthers team that was the CIF Northern Regional Open Division champions, made it close between her and Hernandez for top freshman honors. Although she started all 30 games and had a slow start, and her time was curtailed in some blowouts. It was in the last three games of the season when it counted where Thompson shined on offense and defense. She had 11 points and four rebounds in the NorCal Open upset of St. Mary’s, 10 points, six rebounds and three assists in the NorCal Open title-game victory over Mitty, and 14 points, five rebounds and two steals while also being asked to help guard Charisma Osborne in the CIF Open state championship loss to Windward. On the season her averages were 5.3 points, 3.0 rebounds, 1.8 assists and 1.6 steals per game. She was second on the team in scoring and rebounding, and the only stat Willis led the team in was assists (3.2 per game), but when the Warriors top player missed a few games she and her gutsy game and motor were sorely missed. Had Willis not been dinged up this season Valley Christian may have done a lot better and she likely would have improved on her 12.6 points and 4.9 rebounds per game. Willis returns next season and if she’s healthy look for a possible breakout for her.